In another good sign for the housing market, today’s home builders believe that the housing market has turned a corner. For the third straight month, the Housing Market Index — a home builder confidence survey from the National Association of Homebuilders — reported strong monthly gains. December’s Housing Market Index climbed 2 points to 21 in December after a downward revision to last month’s results. The index is now up seven points since September 2011, and sits at a 19-month high. 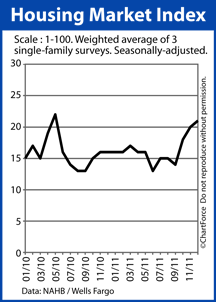 When home builder confidence reads 50 or better, it reflects favorable conditions in the single-family new home market. Readings below 50 reflect unfavorable conditions. The Housing Market Index has not crossed 50 since April 2006. The HMI itself is actually a composite reading; the result of three related home builder surveys. The National Association of Homebuilders asks its members about their current single-family home sales volume; their projected single-family home sales volume for the next 6 months; and their current buyer “foot traffic”. The results are compiled into the single Housing Market Index tally. These results support the recent New Home Sales and Housing Starts data, both of which show an increase in single-family sales, and a decrease in new home housing supply. When demand rises and supplies fall, home prices climb. It’s also noteworthy that the Housing Market Index put buyer foot traffic at newly-built homes at its highest level since May 2008. With even more buyers expected to enter the market, new home prices are expected to rise across Canton in 2012 — especially in the face of shrinking home supplies. For now, though, with home prices stable and mortgage rates low, buyers can grab “a deal”. 60 days forward, though, may be too late. The Spring Buying Season unofficially starts February 6, 2012.